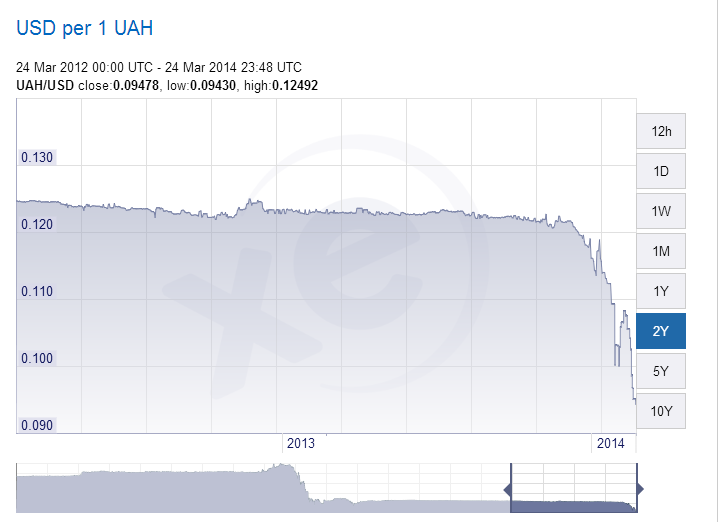 People were quite upset at the failing Ukrainian economy, and that’s why there were protests. No doubt about that. The western media said it was because of the dictator-like, pro-Russian, Ukrainian President Yanukovich. American media, of course, said he looted Ukraine, stole billions of dollars etc. Granted, he might have done that – Ukrainian politics is quite corrupt – the REAL reason is something that the media will never talk about. Why? Because it’s an amazing tool that the IMF and the World Bank have used against smaller countries for decades. Very efficiently. The central bankers of Ukraine – the puppets of IMF/World Bank – FIXED the Ukrainian currency (Hryvnia) to the U.S. dollar. So for many years, it was fixed at about 8 Hryvnia to 1 dollar. You see, Ukraine is export oriented. They are one of the largest exporters of wheat and corn. When you fix the currency of an export-oriented country, it lacks the flexibility. So if price of wheat and corn fall around the globe – as it did throughout 2013 – then that country loses competitiveness. Similar experiments were done on many South American countries, all leading to the same results. The crafty thing is, now that the bankers have taken over Ukraine, they removed that restriction. Just in the last few weeks, the value of Ukrainian currency has fallen by more than 25%, with 11 Hryvnias fetching a U.S. dollar now. Why? Because, now the western banks and corporations are going to buy up a lot of Ukraine assets – think corporations, banks, land, mineral mines, water, utilities, airports … you name it. And they want to buy them at a discount. So they will manipulate the currency so it falls even more. It’s actually easy. The rating companies like S&P, Moody’s etc will suddenly find some data and “downgrade” Ukraine. Bingo! This is the kind of stuff that the corporate media won’t talk about. They still enjoy feeding the simple narrative of one President or a Prime Minister being responsible for everything that happens in a country. Not true anymore. The financial wizards rule the world now.